I don’t know if a variety of bolts mounted on to a 4′ x 3′ piece of plywood would be categorized as outsider art or folk art or found art or plain old bolt art. Many years ago, I saw such an art piece displayed on the wall of a lovely stationery store where the proprietor was hosting a benefit auction. I don’t remember who or what was going to benefit from the raised money, but I do remember that the cartoonist Nicole Hollander was there. But the bolts. I think there were about 20 of them displayed. And underneath each bolt, there was a printed notation indicating the Chicago intersections where each bolt had been found. Western & Lawrence. Hoyne and Le Moyne. Clark & Ohio. I put on my skeptical hat. I certainly had never seen one bolt, let alone several, haphazardly lying in the street. The universe was out to teach me a lesson. A few days later, my friend and co-worker Pat and I were waiting at a traffic light on lower Michigan Avenue, right outside of Chicago’s famous Billy Goat’s Tavern. It was a rainy day, and we were taking the underpass to dodge as much of the downpour as we could. While the underground traffic whooshed past in front of us, above us the iron bridge works rumbled and shook from the weight of the buses, cars, and trucks speeding by on the upper level. Then a bang, a clank, a clang. Something fell, splashing into a puddle, landing right at my feet. You guessed it. A bolt. 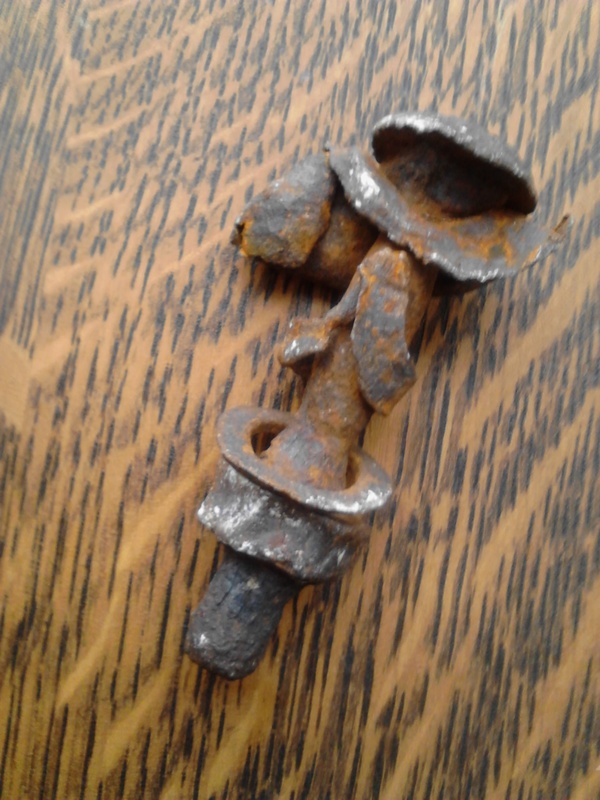 It was a gigantic bolt, partially rusted and partially oxidized green. I displayed that big bolt on my bookcase for years. Ever since that event a decade ago, I regularly see bolts in the street, sometimes in intersections, sometimes kicked to the curb, in my hometown or on vacation, on country roads and on the highway. She and I are probably doomed to experience such bolt encounters for the rest of our lives. I’ve always been curious about the meaning of synchronicities, but this one has me stumped. What does it mean though, Mr. Sophocles, when one constantly detects what is totally unsought?